Using Spring Cloud Data Flow Server OpenShift, we will deploy a stream to OpenShift, including a custom Spring Cloud Stream processor application deployed to a local Nexus repository with a custom Dockerfile. 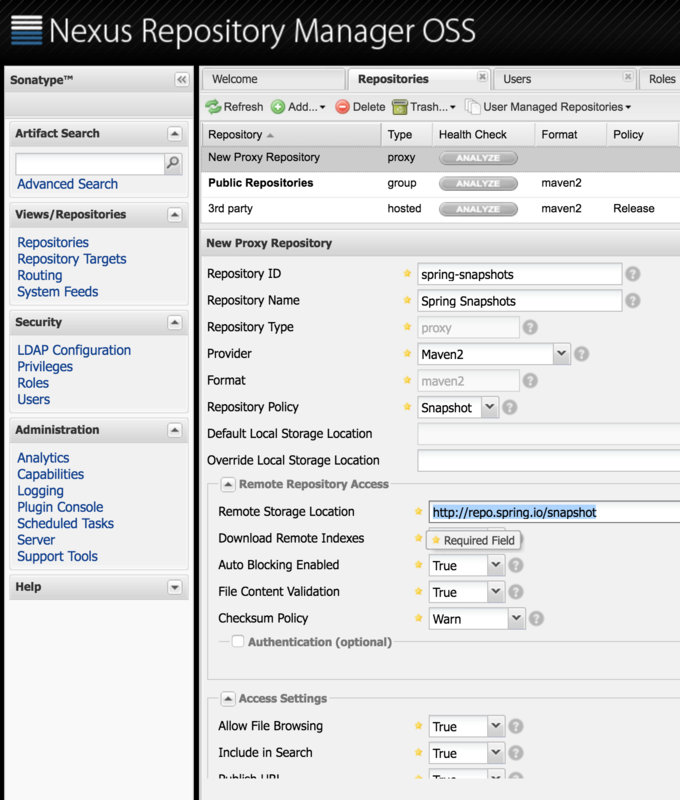 This post follows on from the introduction of Spring Cloud Data Flow Server OpenShift using Spring Cloud Deployer OpenShift. If you have not yet read the previous post, it is strongly recommended you do so. Update (2017/02/19): Since this post was written, a 1.1.0 release of the Spring Cloud Data Flow Server for OpenShift has been released. This release simplified the deployment of the server in an OpenShift environment using Templates and should be considered the recommended deployment mechanism. For more information, see the “Getting Started” section to deploy the server as well as the “Deploying Custom Stream App as a Maven Resource” section in context of this post. This post will introduce the “thumbernator” application. A Spring Cloud Stream processor that augments the incoming message on the input channel with a 👍. Useful? Nope, but it will help me demonstrate how you can use the OpenShift server/deployer to deploy an app built and deployed with Maven to a local Nexus repository and which uses a custom Dockerfile for the image build on OpenShift. In the previous post we used the Fabric8 Vagrant box for a local OpenShift instance. Conveniently, this configuration also includes a running Nexus instance. It is deployed under the default project/namespace and has a Route of http://nexus.vagrant.f8. To simulate as closely as possible a “real” development environment (and to show the server/deployer’s support for remote repository authentication), we will add some security to our Nexus instance. 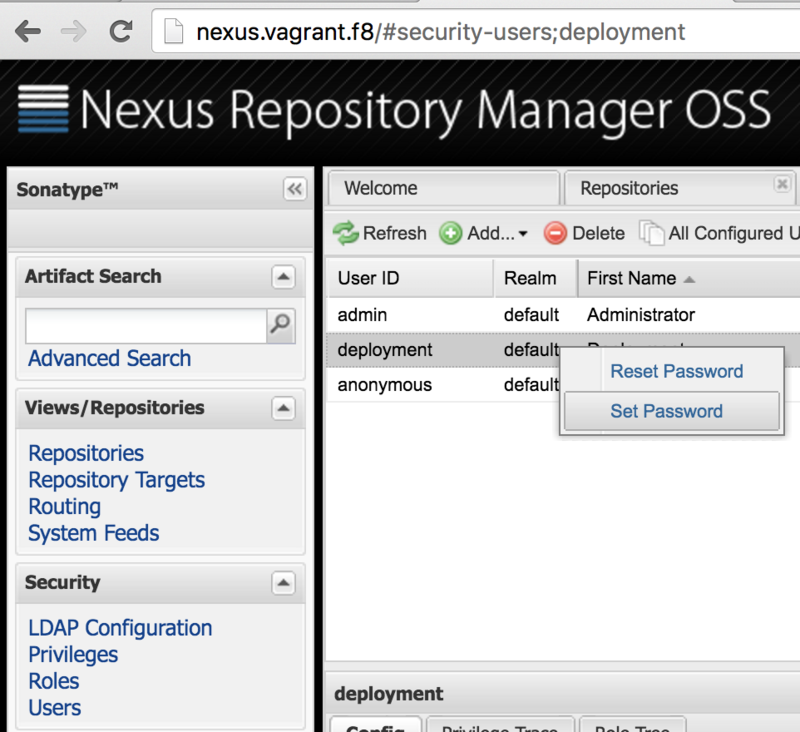 Go to http://nexus.vagrant.f8 and login with admin/admin123. Now open the “Security” accordion and select “Users”. Right click on the “deployment” user and “Set Password” to password. Granted, this isn’t the most secure Nexus repo you’ll ever encounter but it’s ok for now. Besides, the Nexus instance is ephemeral and all your config will be blown away if you bounce your Vagrant VM. Ultimately this allows us to resolve Spring Cloud Stream Starter Apps (like the Http and Log OOTB applications) as well as our locally deployed apps through the same http://nexus.vagrant.f8/content/groups/public remote repository URL. Please see the previous post on the steps required to build the prerequisite projects and the spring-cloud-dataflow-server-openshift project. Note the few extra options this time around. 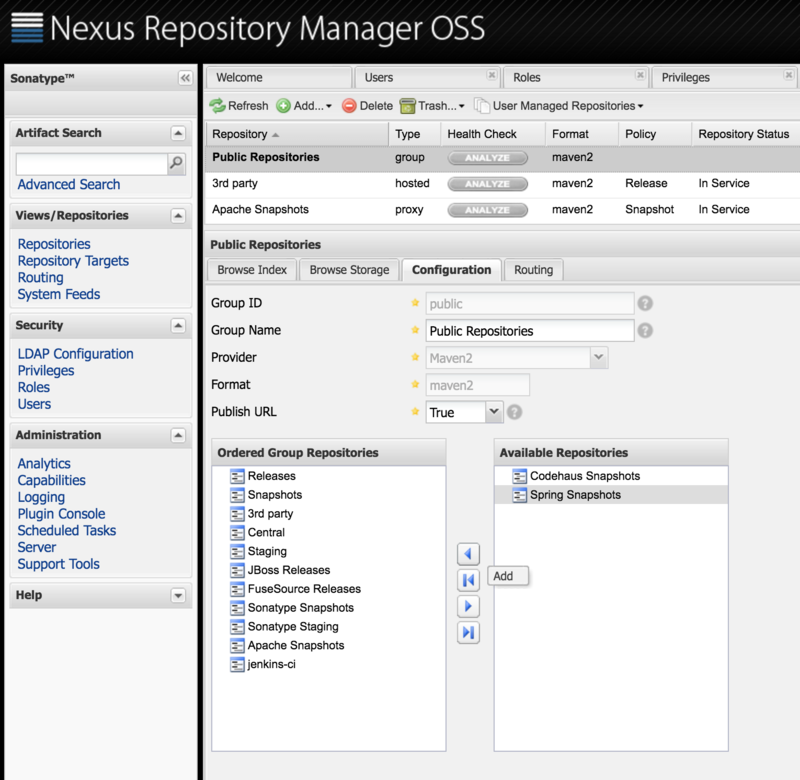 The maven.remote-repositories.nexus. family of properties now point to our local Nexus repository and include the authentication details. We also set the maven.requestTimeout property, which gives our Nexus repository some extra time to download the Spring Stream Starter Apps from http://repo.spring.io/snapshot. Depending on your bandwidth, it could take too long to download these artifacts the first time around and cause your Build to fail with 504 GATEWAY TIMEOUT errors. Note the thumbernator app registered as a processor. Also note that we register the OOTB http and log apps using their Spring Snapshot repository URI’s (e.g. org.springframework.cloud.stream.app:http-source-kafka:1.0.0.BUILD-SNAPSHOT). 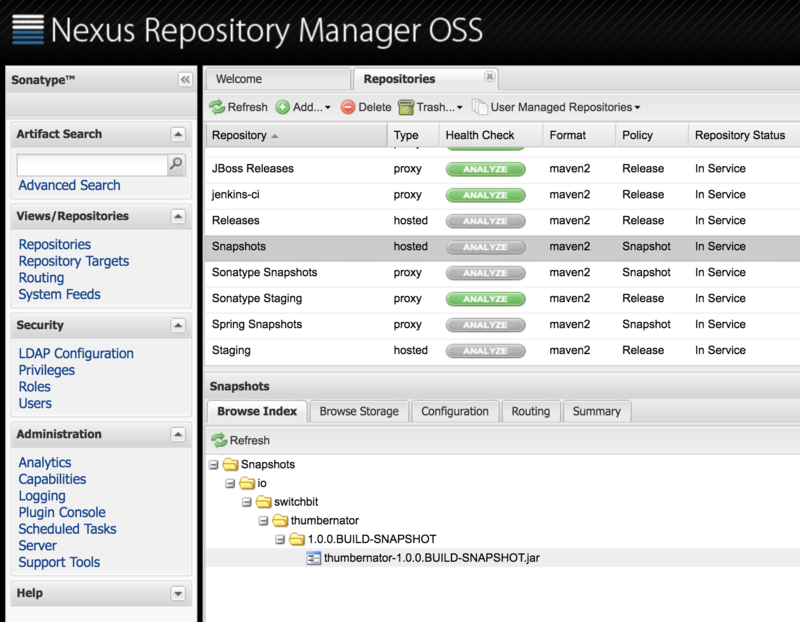 This is where the previous step of configuring a Spring Snapshots proxy repository in Nexus becomes quite important. Currently, the OpenShift deployer only supports a single remote Maven repository (with --maven.remote-repositories.). This being the case, the deployer would not be able to resolve the BUILD-SNAPSHOT builds of the OOTB apps and our thumbernator artifact, if it were not for our proxy repository and the Public Repositories group configured in Nexus. dataflow:>stream create --name http-thumb-log --definition "http | thumb | log"
The stream definition, Http and Log apps are described in more detail in the previous post. Please read that post first if you are not sure what is going on here. Straightforward, we’ll accept an HTTP POST, send that to the thumbernator and then log the output (or input, depending on your viewpoint). no, no wait. Our thumbernator app failed to build. But why? It goes without saying that you will not be able to clone the thumbernator app from my repo, unless you get hold of my private key, which I hope you don’t. However, you could push the thumbernator app to your own GitHub (or even Bitbucket) account and replace the repository references where applicable. Hmm, looks like we couldn’t authenticate when trying to clone the source from GitHub. Darn. Wait… what is actually going on here? Why is it trying to clone from GitHub when the artifact is in Nexus? If src/main/docker/Dockerfile is detected in the Maven artifact Jar, then it is assumed that the Dockerfile will exist in that location in a remote Git repository. In that case, the Git repository source is used in conjunction with the Docker build strategy. The remote Git URI and ref are extracted from the <scm><connection></connection></scm> and <scm><tag></tag></scm> tags in the pom.xml (if available) of the Maven Jar artifact. For example, if the <scm><connection> value was scm:git:git@github.com:spring-cloud/spring-cloud-dataflow.git, then the remote Git URI would be parsed as ssh://git@github.com:spring-cloud/spring-cloud-dataflow.git. In short, the Dockerfile from the remote Git repository for the app being deployed will be used (OpenShift actually clones the Git repo) as the source for the image build. Of course, you can include and customise whatever and however you like in this Dockerfile. If you look at the thumbernator project on GitHub, there is indeed a src/main/docker/Dockerfile. Which means the <scm><connection> value was extracted from the pom.xml and used as the Git URI for the Git repository source for the OpenShift build. you can see it is slightly different to the default Dockerfile provided by the OpenShift deployer. For one, it is copying in a script (entrypoint.sh) as the entrypoint. Second, it is using a Nexus API call to download the Maven artifact Jar. This is actually quite important because the default Dockerfile provided by the deployer will not work with a Nexus repository, like it works for the Spring repo’s, which use Artifactory. In other words, this is how you can use your own crafted Dockerfile instead of the default or having to specify a Dockerfile inline as per the other resolution options. Now we know the why, we need to solve the how. How do we provide a private key for Git to use when cloning a remote repository? Well, that’s pretty easy. It’s a secret. No, really. We just need to create a SSH auth secret in OpenShift and reference that when kicking off the build. For this post I’m just going to copy a private key associated with my GitHub account, from my machine to the /vagrant share (the Vagrantfile location on your machine) and then create the secret using the oc CLI tool in a SSH session on the Vagrant VM. dataflow:>stream deploy http-thumb-log --properties "app.thumb.spring.cloud.deployer.openshift.build.git.secret=github-ssh-secret,app.http.spring.cloud.deployer.openshift.createRoute=true,app.http.spring.cloud.deployer.openshift.deployment.route.host=http.vagrant.f8"
Note the deployment property app.thumb.spring.cloud.deployer.openshift.build.git.secret=github-ssh-secret which indicates that the thumb app should include the “github-ssh-secret” source secret. The http and log apps built successfully last time, so they don’t get another build but rather just get deployed using the existing image. 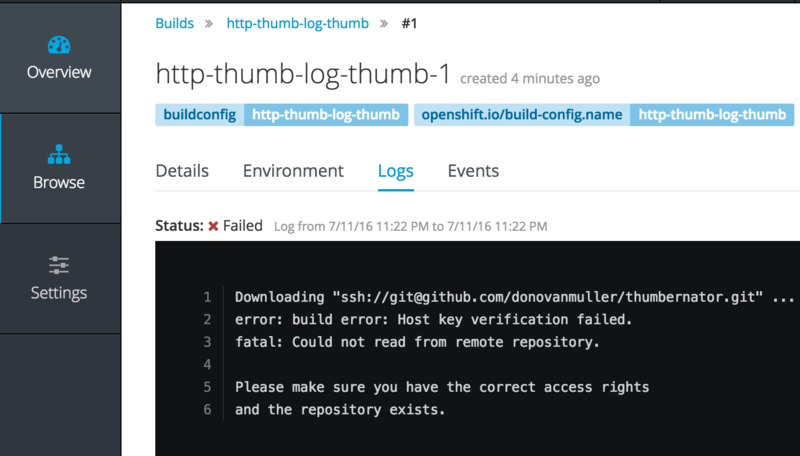 Our thumb build can now clone our source, using SSH authentication to GitHub with our “github-ssh-secret” secret. The current implementation only supports cloning a remote repository using the ssh:// scheme. HTTPS support will be added in future. > POST (text/plain;Charset=UTF-8) http://http.vagrant.f8/ OpenShift liked this! there it is. Considered yourself 👍’d. 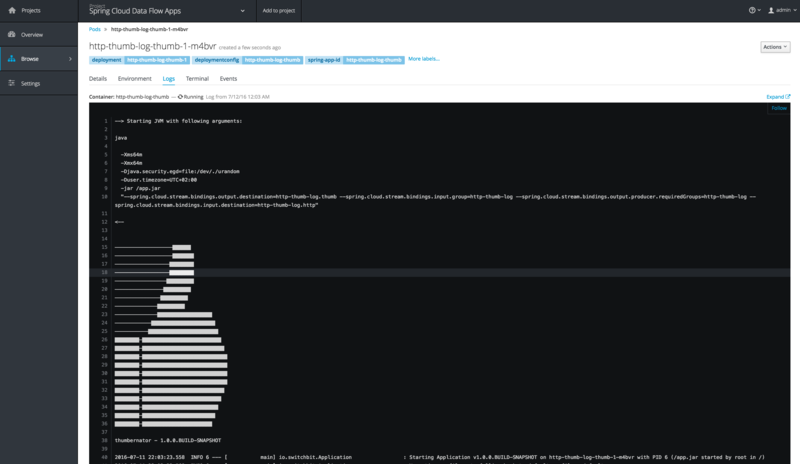 Our pointless (but awesome) thumbernator app demonstrated how we can resolve local apps deployed to a Nexus repository and how we can implement a custom Dockerfile for the OpenShift build kicked off by the OpenShift deployer. This functionality is must in a “real” environment, where the default Dockerfile might not suffice. Whilst using the Shell (or UI) to create and deploy stream/task definitions is convenient, it’s probably not going to scale to deploying in teams etc. Next up will be a Bamboo plugin that will enable deployment of stream/task definitions and even stand alone Boot apps (the deployer is actually not coupled to Data Flow at all).